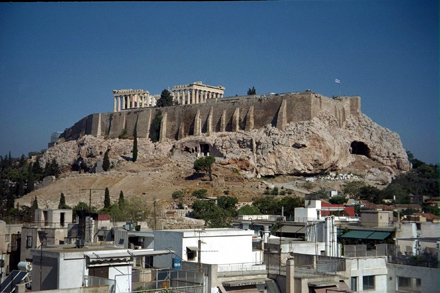 The acropolis (“upper city”) is the major feature of ancient and modern Athens. It is 512 ft. [156 m.] above sea level and it rises 300 ft. [90 m.] above the lower city. It is [320 m] long and [128 m.] wide at its widest point. Limestone cliffs outline it on the north, east, and south, while the easiest approach is via the saddle on the west—where the propylaea (ceremonial gate) was located. The acropolis was probably first used for the defense of the residents of Athens, but soon became a religious center. Numerous temples and statues graced its surface—including the famous Parthenon, Erechtheion, Temple of Nike, and other structures. In addition numerous other structures clung to its southern slope. View looking northwest at the southern side of the acropolis. The large building on the top of it is the Parthenon.